A common reply when I tell people that I am a marine biologist is “Ohh I’d love to do that but I can’t SCUBA dive”. Let me firstly correct one huge myth; you do not need to be able to SCUBA dive in order to be a marine biologist. I can immediately think of many colleagues whom collectively study the full breadth of marine taxa yet not one of them have a SCUBA certification. The common public perception of marine biologists is one of a neoprene clad, tanned individual donning SCUBA equipment before rolling backwards off a boat into pristine blue waters. For 99% of marine biologists this is very, very far from the truth. That is not to say that 99% of marine biology isn’t glamorous or cool or exciting. I certainly think it is. Major marine biology discoveries are made all the time in laboratories and museum archives around the world. When this happens these marine biologists are often the first people in the history of humankind to comprehend this new information – now who can say that isn’t cool? 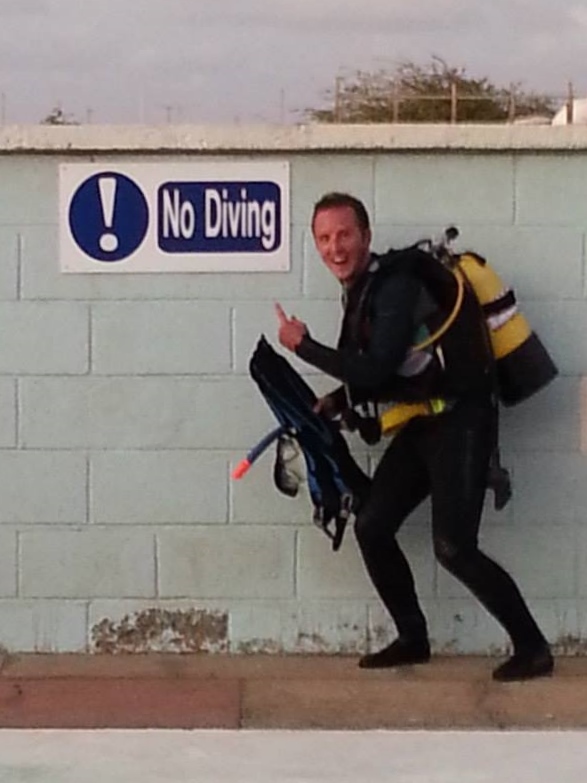 SCUBA diving is not essential for a career in marine biology. I have met marine biologists who can’t even swim! However, I have been very lucky in my career so far in that I have been able to work in a variety of environments from remote beaches to ocean going research vessels and of course SCUBA surveys in some pretty nice locations. If you are set on a career in marine biology AND you want SCUBA to be part of your working life there are numerous ways you can set yourself on the path to this. I should mention however that this is not an exhaustive list and there are many more ways to integrate getting into the water with your career. Choose a degree programme that has optional dive training. Plymouth University in the UK offers the opportunity for its students on marine courses to complete the HSE SCUBA qualification over an intensive 4 week course. This is the route I chose, having first learned to dive as a teenager. To follow this route you have many, many options. The main choice is which qualification agency to get qualified with. In reality it doesn’t matter as they all provide excellent training and there is an international recognition for all qualifications and an understanding of grade equivalency through the excellent system of CMAS (Confédération Mondiale des Activités Subaquatiques) star grading. The PADI (Professional Association of Diving Instructors) scheme is often more common worldwide and attaining the Divemaster certification usually opens the doors to conducting scientific diving. In the UK the BSAC (British Sub-Aqua Club) provides an excellent training scheme with the added benefit of being club based which means there is often a pool of kit for beginners to use, there are regular dives to help you build up experience and courses are often cheaper too! Within BSAC, attaining the Dive Leader or Advanced Diver qualifications are the usual minimum for access to scientific diving opportunities. Some organisations such as Frontier, Coral Cay Conservation or Blue Ventures can provide opportunities to not only gain your SCUBA qualifications but also contribute towards ongoing conservation and scientific work as well as have an amazing life experience in awesome locations – all at the same time. Be aware though that this can be a very expensive route into scientific diving. Qualified already? Contribute to science now! The excellent Seasearch scheme within the UK allows recreational divers the opportunity to contribute to our scientific body of knowledge every time they dive by simply recording the habitats and species they come across. Training is provided, all you need to do is go and dive (and report your results afterwards of course!). For many, learning to dive is often what starts them on to a career in marine biology and it is sometimes what sustains many others. Every time you drop below the waves into this amazing alien world you can’t help be amazed, inspired and motivated. Remember though that for many marine biologists, and for many reasons, choose not to dive but still have incredibly successful and exciting careers studying our oceans. If this ends up being you then don’t forget that you are in good company. 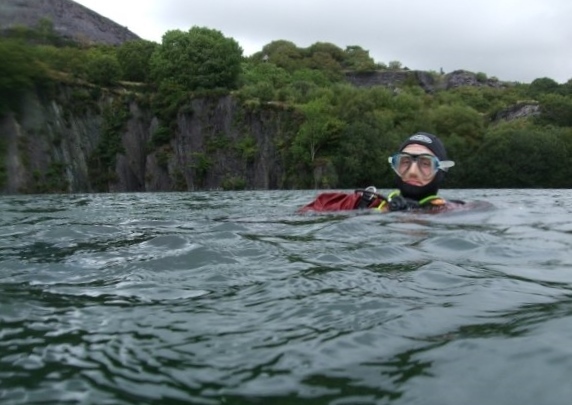 I first developed my SCUBA skills in the cold quarries of the UK. Tough but an excellent training ground.